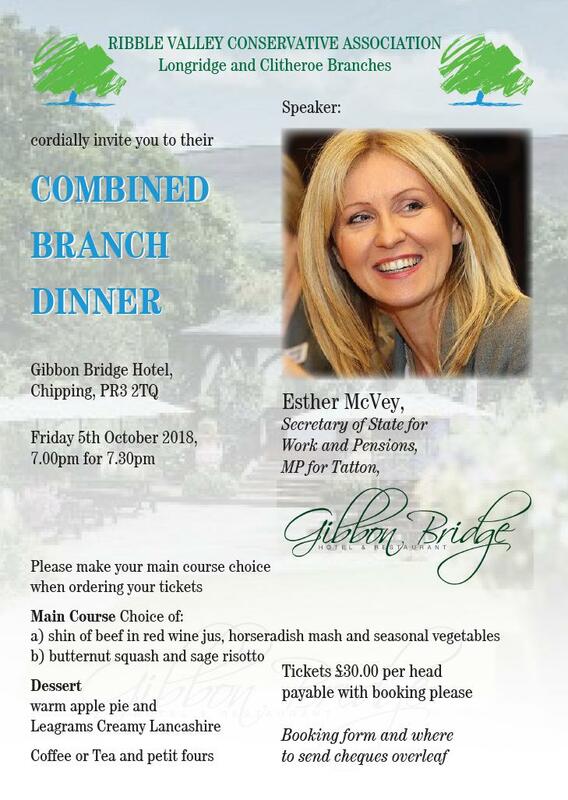 Introduced by Nigel Evans MP, Ester McVey M P Secretary of State for Work and Pensions rallied 100 Ribble Valley Conservatives at Longridge and Clitheroe branches dinner at Gibbon Bridge, accompanied by her partner Philip Davies MP, She warned against a hard left Jeremy Corbyn Momentum government which only the Conservatives can prevent. The Tatton MP stressed she was a Merseyside girl and warned that we are back to the 1980's with Derek Hatton and militant back in the Labour Party.. To borrow a phrase Jeremy Corbyn will do for British business what Diane Abbott has done mathematics. She emphasised the importance of having a party post Brexit able to govern the country in this forthcoming new era, able to negotiate for Britain free trade deals throughout world. She stressed the importance of Conservatives representation at all levels of government beginning locally with retaining control of Ribble Valley and South Ribble Borough Councils in the May 2019 local Borough Council elections.The Secretary of State and Cabinet Member answered questions about Brexit, pensions, housing and unity and urged all Conservatives to be united and work together. On the question of policing she was pressed by local Conservatives to take back the message to the cabinet that closing police stations in the Ribble Valley was a bad idea and look at resources for the police in particular for Sajid Javid, the Home Secretary to look into the appointmentment of a Deputy Police & Crime Commissioner at Public Expense by the Labour Lancashire Police & Crime Commissioner despite the unanimous opposition of all members of the Police & Crime Panel to the appointment. She ended by confirming that following the TV programme' bodyguard' she had brought hers with her- Philip Davies MP.